Maryland’s National Harbor, a waterfront shopping and dining destination owned by The Peterson Companies, faced challenges against perceived competitors such as Annapolis, Georgetown, and other high-end waterfront shopping and dining areas. Money poured into marketing budgets yielded disappointing results. Our team was retained as an agency of record to manage an integrated communications campaign and new national destination strategy. Extensive market research and online sentiment analysis revealed that the destination was marketing itself as an area — like Georgetown or Annapolis — whereas most visitors viewed it as a place, more akin to a resort destination, holding the entire establishment accountable for experiences good and bad. We knew that National Harbor couldn’t compete on the waterfront experience alone, nor should it place its bet on attracting locals away from their neighborhood waterfront destinations. We needed to define new value propositions, new target markets, and a new marketing strategy. We developed new creative that positioned National Harbor as an iconic, all-American, must-see waterfront destination for shopping, dining, events and attractions in the nation’s capital. 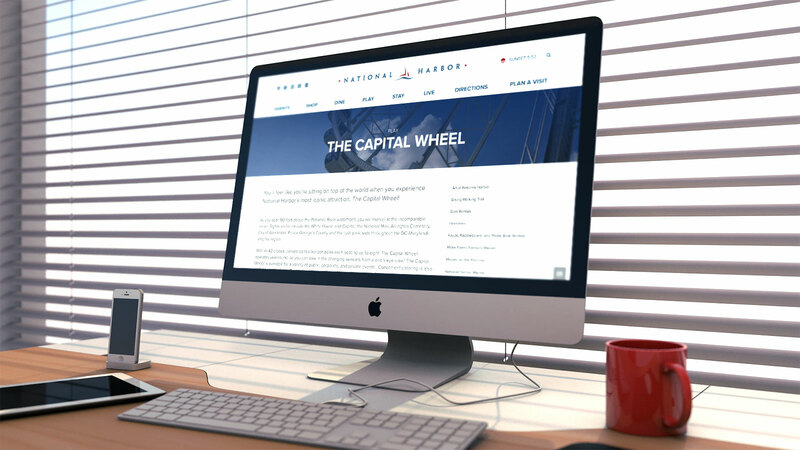 Accordingly, we repositioned the online marketing campaigns, shifted the public relations strategy, increased seasonal event support, and implemented strategic social media campaigns for both National Harbor and its newest attraction, The Capital Wheel. To improve retail and facilitate tourism business, we reimagined National Harbor’s leasing center, telling a more accurate destination story through on-site touchscreen videos also accessible online, allowing the sales team to immerse prospective tenants in the National Harbor vision both onsite and off. To make National Harbor’s other content more portable and accessible, we packaged it into targeted guides — including a corporate leasing brochure, a summer guide and a holiday guide — that could be accessed across viewing devices. 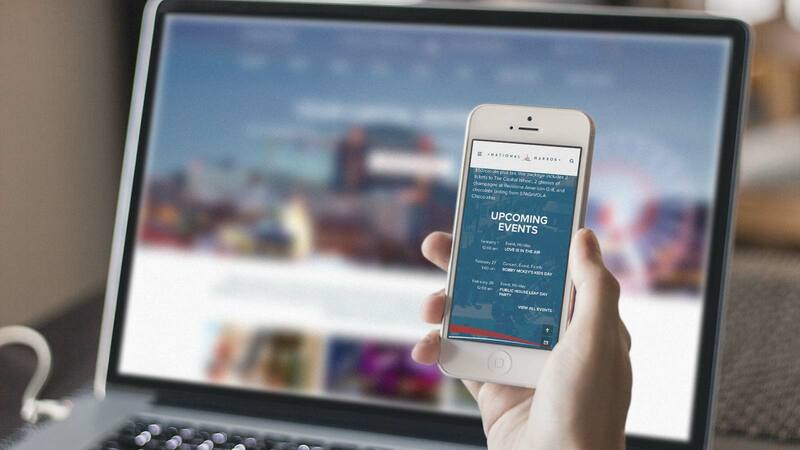 In November 2014, we also re-launched nationalharbor.com to align the site with the brand’s new positioning as well as become more mobile-friendly. National Harbor is quickly evolving into a world-class national destination. As a result of better site optimization, earned media coverage and overall increased awareness of the destination, National Harbor’s organic site traffic increased 436.43% year-over-year, and direct website traffic nearly doubled. Indicating better engagement strategies, traffic from social media sites also increased by 575.90%. Over the course of the same year, our geo-targeted display campaigns reached 22,284 more users, and at the same time we were able to reduce the amount of paid search campaigns with more efficient placements — investing dollars on audiences who already loved National Harbor, rather than competing with the tourism market at large — to complement increased organic site traffic. Altogether, we’ve increased website traffic by 38%, unique users by 35% and page views by 27%, serving 2.7 million site visitors and nearly 10 million page views. On the earned media front, a Joe Biden joke on Saturday Night Live’s Weekend Update — referenced above — becoming the crowning moment of The Wheel’s opening weekend, which was also covered on Good Morning America, ESPN and the Washington Post for a total of $1.2 million in PR value and 16,000 visitors. In addition, our efforts to date have resulted in four MarCom Awards, including one Platinum for The Capital Wheel (media relations, publicity, TV placement), one Gold for National Harbor (marketing, promo campaign, integrated marketing), and two Gold for The Capital Wheel, including marketing, promo campaign, branding, and public relations.